The average price of installed turf is $30 per square metre but the price does depend greatly on the variety of lawn you choose and the area’s preparation needs. Overall, most new lawn projects will set you back around $27 – $34 per square metre. For the lawn turf itself – without installation – the expected price to pay is $7-$14 per square metre. While, in an ideal world, we’d all use a landscaper to install our new lawn, it can be installed yourself (with a couple of mates) in order to keep costs down. The difference in price between the cheapest lawn variety and the most expensive actually isn’t a wide as you might think. Let’s consider a 40 square metre area – basic Kikuyu will cost approx. $320 while Sir Walter DNA Certified Buffalo will cost approx. $480. So, while that is an initial saving of $160, the ongoing higher maintenance on the cheaper lawn variety is also higher. A more expensive upfront lawn with lower ongoing maintenance is actually the least expensive way to invest in a brand new lawn. A survey by Turf Australia showed that the average Australian expected to pay around $15 per square metre of lawn – with this and the true cost of turf in mind, laying turf to create an instant lawn is an extremely affordable landscaping option for your backyard. Even if you invest in a premium turf variety like Sir Walter DNA Certified Buffalo turf, it’s still an inexpensive choice. 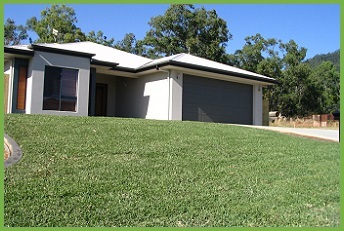 To find out exactly how much your new lawn will cost and the options available to you in North Queensland just contact the team at Harden Park Lawns today.